I would use the word "innovative" when describing this set of game-improving irons. They incorporate an inverted-core technology to expand the sweet spot, giving the irons a bigger and hotter clubface. The cavity back is very traditional looking, and I like the basic teardrop shape. The 3-through-6 irons have a foam-filled chamber directly behind the clubface, allowing designers to construct a very thin (2.0 millimeter) face. The design is built for the maximum amount of spring effect (called COR). This obviously translates to longer distances. It took me a little while to get used to all the material packed in the back of the cavity. It definitely helped to muffle some of the vibration, but I was very concerned that I wouldn’t be able to work the ball as well as with the more traditional blades (or less hefty cavity backs). I was pleasantly surprised when I got the ball to start out to the right and curve the ball back with very little ease. That being said the feel is not nearly as comparable as the blades, but that’s a luxury I’ll give up for more forgiveness. My favorite thing about these irons is the stock shafts that TaylorMade constructs them with. It is a 90-gram KBS steel shaft with a progressive-thickness wall. Why the heck to they have progressive thickness? It’s to give you more support and stability without forsaking feel. For those of you who aren’t golf nerds, the shaft is the motor of the club and what happens right before impact is crucial to where the ball flies. This KBS shaft has a step design that reduces the the radius and mass for each step. Better players will notice a marked improvement on solid hits. I recommend these irons for mid-to-high handicappers who are looking for a traditional-looking cavity back iron that will give them some forgiveness and extra distance on those mishits. In addition better players will appreciate these irons as well if they can get over the lack of feedback that comes with a blade. Hits on the toe and heal are very muted, but the ball flies almost as far as center hits. On an up note, I noticed that when I hit the ball thin I don’t get that horrible vibration up into my elbows. For irons that give you a more feel and more workability but still some forgiveness, I recommend the Nike Victory Red Forged Split Cavity Irons. This is a beautiful set of irons designed for better players who still want a forgiving cavity back. 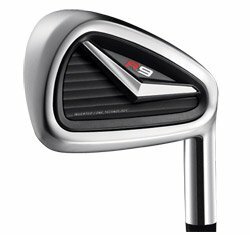 You might also take a look at the Rll irons which have taken the R9s to the next step. The R11’s are just as thin but with a sharp leading edge. The long irons have wider soles then the R9’s which pulls the center of gravity down and makes it easier to get the ball up and flying high. This also creates an even higher moment of inertia for more stability and forgiveness.